Video of a conversation on Rebuild Penn Station hosted by Chartwell Booksellers. Please note that the audio improves at the 15:00 mark. 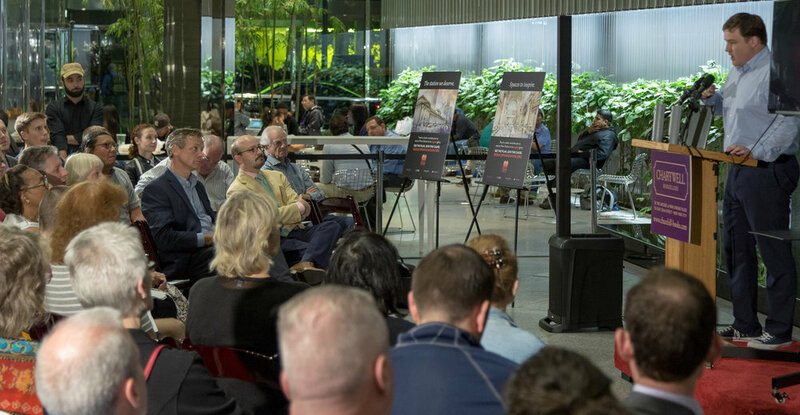 On October 4, 2018 in New York City, Chartwell Booksellers hosted a conversation on Rebuild Penn Station, the National Civic Art Society's project to rebuild the original station. The event featured leaders of Rebuild Penn Station together with design collaborators ReThinkNYC and Atelier & Co.
Until November 1, a scale model of the original station will be on display in the windows of the bookshop, which is located in the Park Avenue Plaza building at 55 East 52nd St. (between Park & Madison Avenues). Also on display is an exhibition of never-before-seen photographs of the original Penn Station taken by the late-Bob Parent, who is most famous for his portraits of jazz musicians.